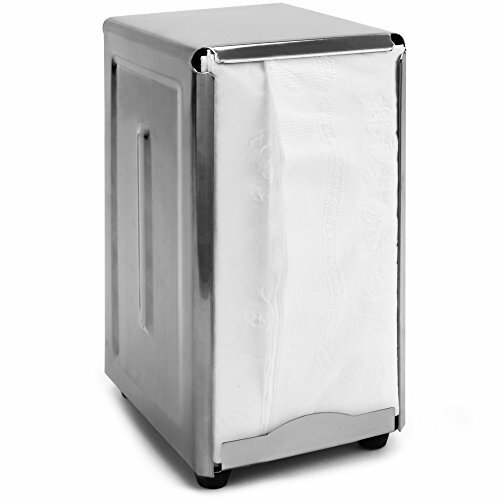 This stylish and retro stainless steel napkin dispenser offers a little dose of nostalgia paired with a whole bunch of practicality. Its simple design is easy to use: just push on either end of the spring-loaded plate to insert your napkins. This model can hold up to a 150 tall napkins at any given time. These dispensers are commercial quality, so they're perfect for replenishing restaurant stock or using in a variety of community settings. Sturdy and stylish stainless steel is durable and easy to clean! Just handwash with warm soapy water to keep your dispenser looking sparkly new. Rubber feet attached at the base of each model designed for a guaranteed grip on any surface and minimizes sliding around; no scratching your table! The double-sided dispensing feature ensures more accessibility and easier loading. NO SLIP GRIP: Features 4 rubber feet for a guaranteed grip on any surface. No slipping or sliding around! USES IN ENDLESS SETTINGS: Perfect for restaurants, cafeterias, workplaces, at home. The list goes on! Manufacturer: Back of House Ltd. Publisher: Back of House Ltd. Studio: Back of House Ltd.